With the passing of the LA Unified school board’s “Good Food” resolution in December, a number of giant vendors the district does business with will be forced to change their practices or lose out on hundreds of millions of dollars in contracts. Tyson Foods in particular, which supplies much of the district’s chicken in a five-year $754 million contract with eight other major food companies, is not currently in a position to meet the district’s new standards for antibiotic-free chicken, according to a report by Reuters. A new five-year chicken contract, along with beef and other items, is scheduled to be negotiated by the school board this spring. “The effects of this could be quite far reaching. We do intend to use the contracting process to leverage important changes in the large agricultural industry,” said LA Unified board member Steve Zimmer, who co-sponsored the resolution along with Bennett Kayser and Richard Vladovic. 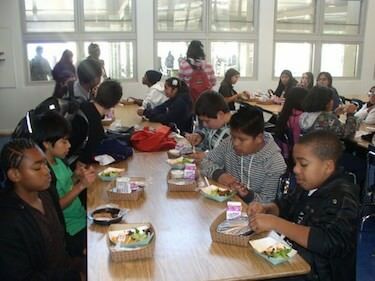 The Good Food resolution partners LA Unified with five other districts — New York, Dallas, Chicago, Miami-Dade County and Orlando County — as part of the Urban School Food Alliance. Alliance members will use their purchasing power together to “drive quality up and costs down while incorporating sound environmental practices,” according to its website. Aside from antibiotic-free chicken, the Good Food resolution requires the district to emphasize certain priorities when negotiating food contracts with vendors, including finding locally-sourced food that offers “generous portions of vegetables, fruit, and whole grains; reducing salt, added sugars, fats, and oils; and by eliminating artificial additives.” It also calls for using vendors that meet certain environmental standards and are proven to provide a safe environment for workers and a cruelty-free environment for livestock. Zimmer classified the resolution as an “application” of a 2012 food resolution co-sponsored by himself and former board member Nury Martinez, in that it uses more specific language and guidelines that must now be used in future food contracts. Zimmer said that the resolution means major companies like Tyson will have to change their practices or miss out on contracts with the Alliance. The buildup to the resolution came with little fanfare — no press conferences or even press releases for a move that overhauls how the district spends over $100 million a year in food procurement. According to the resolution, which comes as the district is facing a budget shortfall of $326 million next year and demands by the teachers union for significant raises in a new contract, the district estimates the new guidelines would drive up the food budget one percent to three percent. Commentary: Are Los Angeles high school students ready for tomorrow’s job market?